These will become Open on 1 April, and available to download on our DataShare site on the 5 April. Our flood datasets are among the most used by current users. Opening them up will help raise awareness of areas that have previously flooded and those we believe to be at risk, helping those living or working in or near those areas to be #floodaware and plan accordingly. 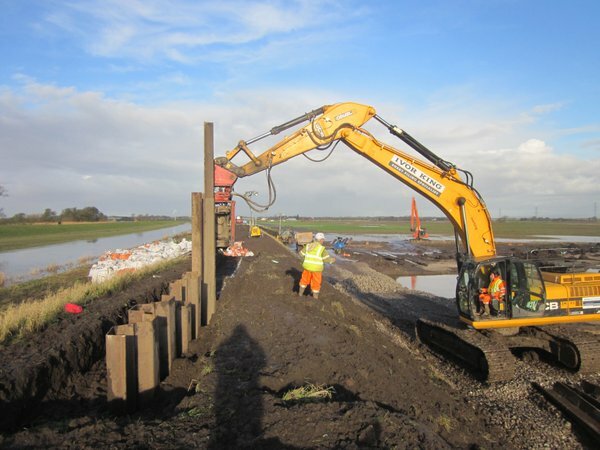 Access to historic flood data helps us be #floodaware and build and rebuild defences where they are needed. This defence was rebuilt in Croston in January. Photo Credit: Environment Agency. It will soon be easier for developers and companies to create applications and websites, and integrate the flood risk data into their systems to make it more accessible to everyone, for example through environmental searches associated with property purchases. Being published as open data means they will help inform sound planning, development, or community/personal flood resilience decisions, either directly or via an application or website. We hope that through user feedback, such as identification of areas previously flooded we were not aware of, we can improve our data. We will also remove the charges for our surface water flood map data from 1 April and will make it fully open in the near future. Follow the EA data Twitter account for updates on how we’re progressing with this. Consented Discharges to Water (and Red List Discharges); and Water Abstraction datasets are being made available, subject to application, for no charge under a special licence. We’re currently pulling together some environmental challenges, which we believe these datasets could help provide the solution to, by combining with other data, in an app or on a website. We’ll be sharing our challenges soon to see how users of our Open Data can help solve them . We’d also love to hear what clever things you’ve done with our Open Data, so please get in touch.